I agree with your sentiment, but NYC was once a wetland too. Maybe the more intensive land use makes it better; McMansions are pretty crass in comparison. And they will become wetlands once again...when Greenland or the Ross Ice Shelf thaws out. Amen! Soon the entire country will be houses and Wal-Marts. 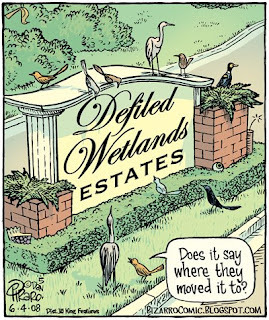 I just wonder how many Defiled Wetlands Estates dwellers understood the point when it appeared. "Fixedxorbroken" makes a good point about New York, of course. (as does "Marin_Explorer") I can't change the past, so I'm grousing about the present and future, of course. Up to a point, humans had fairly little impact on the planet as an organism. Now that exponential math has begun to snowball, we're past the tipping point. there was just a story on the news this morning where a moose wandered onto a playground at an elementary school, so the principal locked the school down until local police and animal control tranquilized it and dragged him back to his home. it made me very sad, and then i really thought about what they were actually doing..
what did they tell the children when they locked down the school? "We have a threat of local security, please remain calm and inside the school. There is a moose hastily eating the playground grass, and we MUST rid the property of his devilish behavior. Don't worry, you are safe inside this priso- i mean building. We will be shooting it with a giant tranquilizer gun-- no telling how many times.. moose can be vicious and intolerable beasts. We will let him go back into the wild as soon as he wakes up from his chemically induced nap. Now let's chant the pledge together and don't forget-- we are one nation under God, children." shortcake, be happy they didn't kill the moose. Moose can be very territorial and have been known to kill people who walk too close to them. The choice may be between moving the school and moving the moose. You could argue that the school is encroaching on the moose' habitat, but the easy answer is to move the moose. The building alone covers a good five acres, not even counting the parking lot. 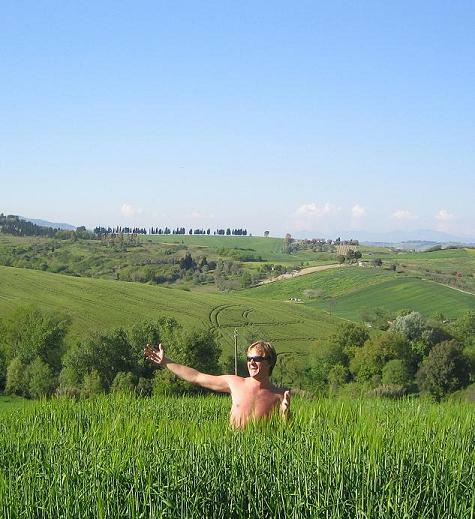 It used to be a really cool rolling meadow in which I saw antelope on a pretty regular basis. Thankfully, one can still see an antelope there. It costs a lot of money and the antelope is dead and stuffed and I don't want to know what kind of energy it takes to air condition the place, but you can see it. 'Scuse me. EXPERIENCE it. The icing on the whole stinking cake is that this heinous place gets taxpayer support.